After any procedure with dental implants is very important the maintenance but the maintenance that our patients do. What I wanna show you today is one of the many things that you need to do to have that area clean. You need to brush your teeth but you also need to have a good health of the gums. With your floss, with your toothbrush and also with things like this, the water flosser from water pick is one of the things that I can really recommend you. Remember that the implant is now placed on the bone but is surround it by gum, there’s always a small space that need to be clean always, always that gap, that micro-gap that we have we don’t want food to be trap there, that’s very important. So how does this water flosser water big works? I’m gonna show you. It comes likes this, it has a container for the water, you have this that is a motor with you plug in, and here where you can put all the points that come, different types of points. This machine should last a long time this is very important and it has the on and off button and also it has ten levels. I recommended to be in the middle, depends on how sore so you are the after the implant restorative work of after you place implants, there are so many techniques, and this cord attaches to the attachment that moves here so you gonna put the point here and you gonna feel that click. This machine is intendent to throw water, we fill this container with water, place it here and it works like a pump, absolutely is a pump, the water is gonna go through this hole that you see here, this hole that you see here and is gonna throw water through here, like those machines where they clean those a streets, which throwing water, well this is specially to dentistry. This is the way that this machine works and I think is a great invention and it works very good for doctors. What’s the problem? They probably the doctor has an amazing result with the implant, with restorative work but the aftercare instructions sometimes they are not given. 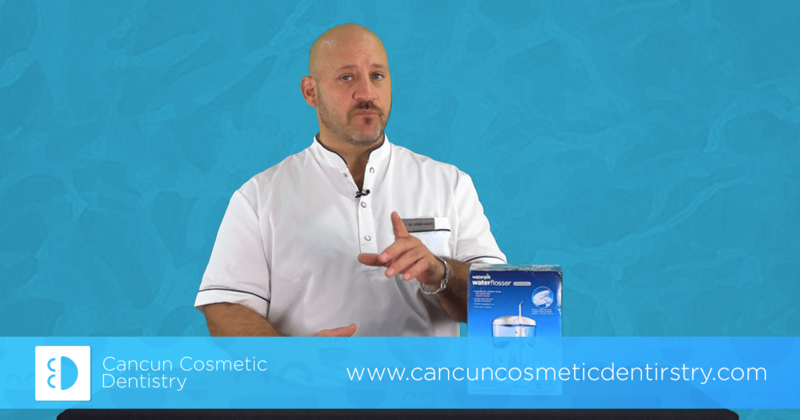 I wanted to do this video because many many patients that I’ve seen, I really recommend this product because it works really really good for them and is part of our continued education with patients. So if you have any questions or doubts don’t hesitate to call us, email us or get in contact with us to our websites and our call centers, but anyway this type of products is gonna be another thing to help you out to have that healthy implants to work. I’m Doctor Arzate and I’m happy to assist you and whatever you need please don’t hesitate to contact me, thank you.